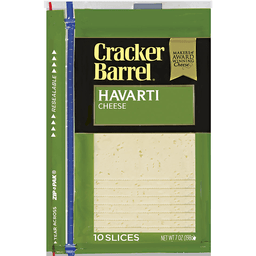 Cracker Barrel Cheese Slices Havarti. Creamy & buttery with a smooth texture. Now with. More slices! 12 slices. Net wt 7 oz (198g). The difference is in the cheese. Founded in 1954, cracker barrel is a brand born from a love for quality cheese. Our high standards come from a belief that cheese making is an art perfected by experts with decades of experience. Whether served on top of your favorite sandwich or eaten by itself, the deliciously different taste of cracker barrel cheese will keep you coming back for more. Zip-Pak®, the Zip-Pak logo® and the Color line Design® are registered trademarks of ITW. 1-855-237-8748, have package available. kraftheinzcompany.com.